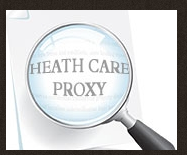 What is a Health Care Proxy ? In Massachusetts, a Health Care Proxy is a written instruction by a person who appoints another individual to act as their Health Care Agent. The Agent is appointed to make medical or health decisions when the person is incapacitated or unable to communicate such decisions. This document provides you with the ability to control the manner in which you will receive medical treatment, in the event that you require life sustaining procedures. The Health Care Proxy becomes effective only after your attending physician states in writing that you no longer have the capacity to make or communicate your own health care decisions. Your Agent’s authority is effective only for so long as you cannot make your own medical decisions. Should you regain your capacity to make decisions, the Health Care Agency is terminated.